Tailored to toddlers nutritional needs. Contains DHA (omega 3). 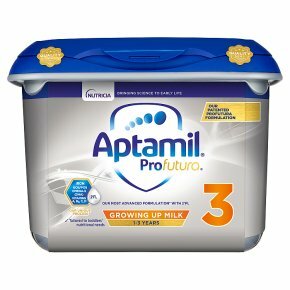 Aptamil Profutura Growing Up milk, nutritionally developed for toddlers from 1-2 years. Enriched with iron To support normal cognitive development. Contributes Essential Fatty acids (ALA & LA) Needed for normal growth and development. The beneficial effect is obtained with an intake of 2g of ALA and 10g of LA per day. Patented blend of GOS / FOS (9:1) Contains our patented blend of galacto- and fructo-oligosaccharides. High in vitamin D and source of calcium and vitamins A & C Calcium and vitamin D are needed for normal growth and development of bone. Source of Iodine Iodine contributes to the normal growth of children. 2 beakers a day Just 2x150ml beakers each day of Aptamil Profutura Growing Up milk is one way to help support your toddler's nutrient intake in combination with a healthy balanced diet. Preparing your toddler's drink Because powdered milks are not sterile, failure to follow instructions may make your toddler ill. 1 Measure 150ml of 5fl.oz boiled, cooled water into a clean beaker. 2 Using the scoop provided, add 5 levelled scoops of powder into the beaker. 3 Mix well (for 10 seconds) to dissolve powder. Replace lid on beaker. 4 Check temperature and drink immediately. Feeding guide Your toddler will need about 2 x 150ml beakers of Aptamil Profutura Growing Up milk a day, as part of a balanced diet. Aptamil Profutura Growing Up milk is specially formulated to help meet the increased nutritional needs of toddlers from 1 year onwards. Approx. 1 beaker: No. of level scoops per drink (1 scoop = 5g): 5, Quantity of water per drink: 150ml; 5fl oz Important: Always use the scoop provided, please note the colour of the scoop in this pack may change from time to time. Feeding instructions Make up each drink as required. For hygiene reasons, do not store made up drinks. Discard unfinished drinks as soon as possible and always within 2 hours. Do not heat drinks in a microwave: hot spots may occur and cause scalding. Toddlers should be supervised at all times when feeding.